Students discovered how Schneider Electric contributes to reshape industries, transform cities and enrich lives. Rueil-Malmaison (France), October 16, 2017: Schneider Electric, the leader in digital transformation of energy management and automation, hosted from 10th to 13th October the 12 finalist teams of the seventh Go Green in the City, its international student competition to find innovative energy solutions for smart cities. Over these three days, these students from all over the world had the opportunity to discover Schneider Electric along with its expertise and culture of innovation, while also receiving practical career advice. With Go Green in the City, Schneider Electric aims to share its vision and values with the competing students. In a fast-changing world, numerous opportunities are offer to drive innovation at every level through connected energy management and automation technologies that reshape industries, transform cities and enrich lives. At Schneider Electric, we call this Life is On. Go Green in the City exemplifies the values that define Schneider Electric and lived daily by its people. Everyone at the Group strives to be straightforward, to challenge themselves and be open, passionate, and effective in whatever they do. This is what makes Schneider Electric and its employees unique. For the 24 student finalists, these three days of immersion represented the result of personal investment over several months with constant support from Schneider Electric. Each semi-finalist team was mentored by a Schneider Electric employee, who contributed not only technical expertise but also advice on project management and preparing for the final presentation to the prize jury. In addition to presenting their projects, the 12 teams took part in workshops and presentations on the Group’s activities. They also visited the showroom of Schneider Electric innovative solutions. Owing to the several exchanges at Schneider Electric, the students not only experienced the Group’s multicultural atmosphere and stimulating working environment, they also benefitted from the opportunity to build a professional network. The winning team of the seventh edition of Go Green in the City is Team PHOENIX from the Indian Institute of Technology Roorkee for their idea to use the water-cooling properties of earthen pots, a quality long recognized in India, to help cool rooms. 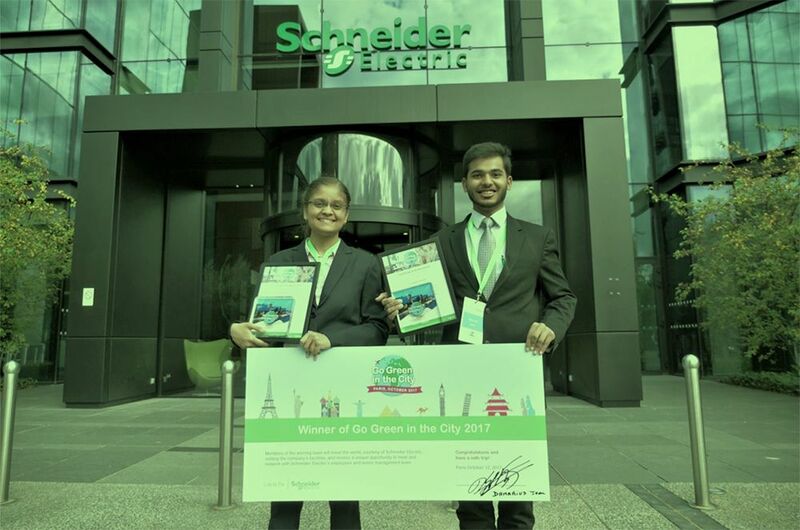 The winners, Raja Jain and Nimisha Gupta, have been awarded a world VIP-style trip with Schneider Electric, visiting 2 destinations facilities and networking opportunities with employees and senior management. Both winners will also be offered a professional opportunity at Schneider Electric. The other finalist teams will be offered the possibility of attending a recruitment interview and receiving advice for future interviews.